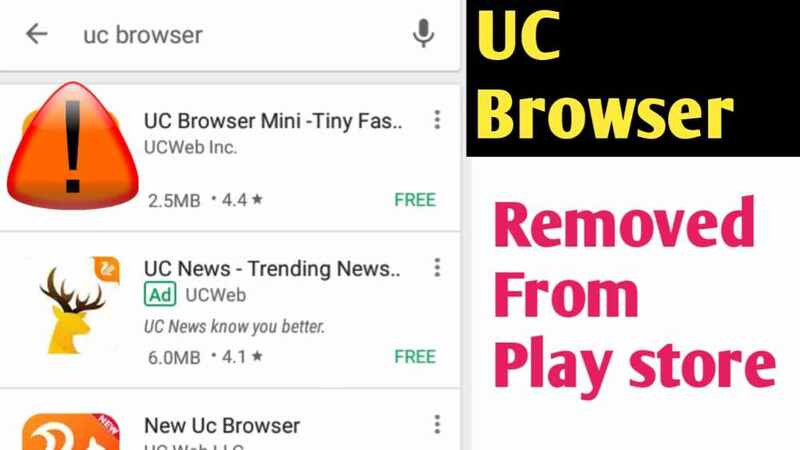 UC BROWSER Removed From Play Store Latest News: Uc browser to Aap me Se Bahut se Log use Karte he Hoge par kya aapne abhi Play Store Par dekha UC Browser Ko Play Store Se Remove Kar Diya Gaya Hai. Iska Reason kya Hai wo to pata nai chala but Google Play Store se uc browser ko hata diya gaya hai. Why Uc browser Removed from play store ?? Uc browser Chinese Browser hai or India me Bahut Popular Hai. Uc browser ko lekar kahi baate Samne aa chuki hai jaise ki uc browser user's ke data ko chain me sell karta he or internet use karna bhi Safe nahi he to ho sakta he ki aisei he koi wajah Se uc browser ko play store se remove kiya Gaya Hoga. Uc browser Removed Ho gaya hai but abhi Play Store Par uc browser mini available hai or saath me uc news bhi. Ab iske piche complete Reason kya Hai Ye pata nai chala he but aap dekh Sakte ho ki play store se uc browser Delete Ho gaya hai. 0 Response to "UC BROWSER Removed From Play Store Latest News"